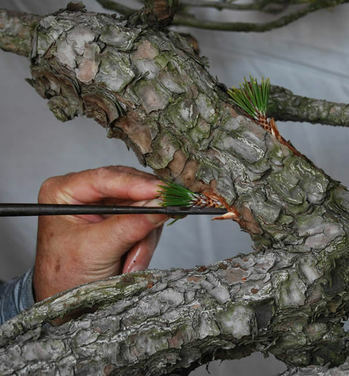 The ways to cultivate bonsai are Misho (seedling), Tsugiki (grafting), and Sashiki (cutting). Tadashi Ayada, Ryoshoen bonsai garden in Takamatsu's Kokubunji town, told us the main way of Tsugiki in Kagawa. Tsugiki is suitable for the trees which can't be grown by Misho and Sashiki. The good point is the tree grown by tsugiki has the same nature of mother trees. Usually a two years old Kuromatsu grown by Misho is used as a stock for Tsugiki. "Teitsugi" puts a tree having a diagonally cut to base of the root and "Takatsugi" puts a tree to cleft at the tip of a stock. It needs the advanced technique to make the joint naturally. 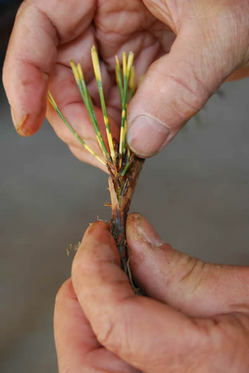 The trick is to put a good new bud from the top of the tree or the apex of branch in the stock to fit the each cambium. By this way, any Matsu can be created. Mikitsugi is one of Ayada's special skills which grafts a tree to unbranched or withered part of trunk by a chisel and a hammer to make a new branch. This adaptation is like a transplant for the human. First, scrape the rough bark off. Next, make a hole and immediately put the scion. Then, wrap it with the bog moss and tapes, and cover it with a plastic bag of water. After the half a year cultivation inside, put the tree on a bonsai shelf to catch the sunlight. It is good for an insignificant tree to make the best use of some good parts. After the growth of the new branches, he sometimes cuts the original branches off. The tree will become a new one. The artists decide the point where the new branches are made and what the tree looks like. It depends on their technique and sense.